Eclectic? Us? Yes, indeed! While we're rooted in the choral classics, we love to try new things. Looking back, the styles of music we have performed in the last couple of years range from 16th century European madrigals to 21st century pop music, with stops along the way to take in the sublime Mozart Requiem for our memorable 50th anniversary Gala Concert. Here's some information about where we've been recently. One thing's for sure - there'll be new places to visit in the months and years ahead! 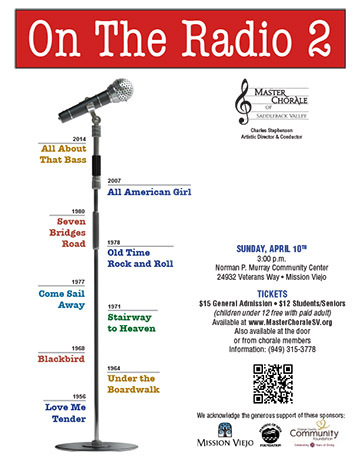 We had so much fun with popular music last time we tried it - "On the Radio!" in April 2014 - that we decided to do it again. The new, improved 2016 model, "On the Radio 2! ", hit the streets in April 2016, with brilliant choral arrangements of popular songs from the last half-century. Would we find anything to top "Great Balls of Fire" and "Bohemian Rhapsody"? You had to be there to find out! The heart of our year is always holiday season. We love to be part of your celebration, and we love to present our music to our friends , families - but also to folks who can't be at home for the holidays. 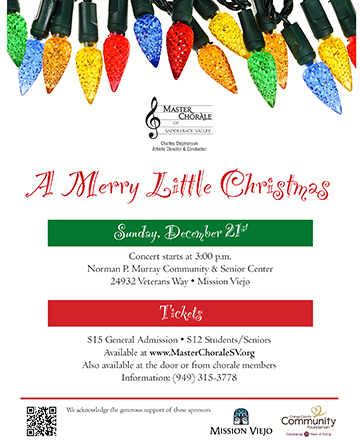 We presented an enticing program of holiday favorites - songs everyone would know and love , and some which might have been new. It turned into a great way to get into the holiday mood - we had a blast, and the packed audience seemed to have fun too! And, by popular demand, the hippopotamus was back! In two concerts the weekend of June 19-21, we presented a beautiful program of songs drawn from the inexhaustible treasure-house of American choral music - the music of Jester Hairston, Morten Lauridsen (his glorious "O Magnum Mysterium", which we all remember from Jim Svejda's pledge break segments on KUSC!)) and many others. 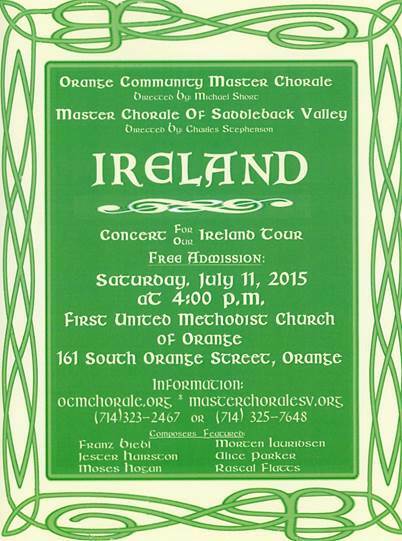 The concert, titled "Americana", formed the core of the program the Chorale performed on our tour of Ireland in July 2015. 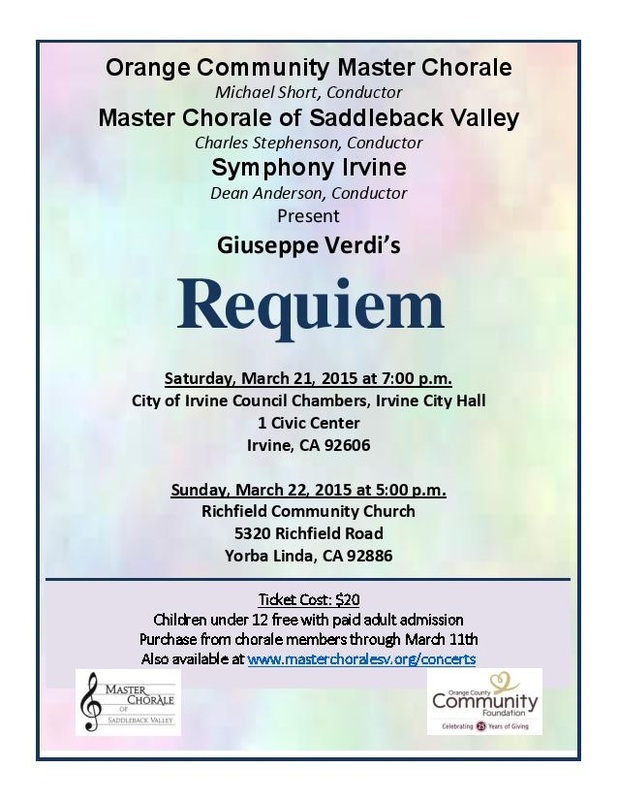 In co-operation with the ﻿﻿﻿Orange Community ﻿Master ﻿Chorale﻿ ﻿﻿(Michael Short, Director) and ﻿﻿﻿﻿﻿Symphony Irvine﻿﻿﻿﻿﻿ (Dean Anderson, Director), we presented two performances of Giuseppe Verdi's magnificent "Requiem". The Verdi Requiem is one of the great masterpieces of the choral repertoire - at one moment astonishingly powerful, at another quiet and reflective. The Chorale enjoyed the opportunity to sing with new friends from OCMC, and to work with the talented orchestral musicians of Symphony Irvine. We were also privileged to sing with four outstanding soloists, Rebecca Sjöwall (soprano), Susan Ali (mezzo-soprano), ﻿﻿Javier Gonzalez﻿﻿ (tenor) and John Davies (bass/baritone). And, if you want a taster of the earth-shattering Dies Irae (The Day of Wrath), watch Claudio Abbado, the Berlin Philharmonic and the massed choirs of the Swedish Radio Chorus, the Eric Ericson Chamber Choir and Orfeón Donostiarra - here. It's difficult to imagine anything more satisfying than being part of a performance of this glorious work. We enjoyed our holiday season this year. No hippopotamuses, sad to say, but there were lots of wonderful Christmas and Hannukah songs for us to sing and for our audiences to enjoy. The British Isles (England, Scotland, Wales, Ireland and smaller islands) has an unfathomably rich tradition of folk music. Much of the turbulent history of these ancestral islands is written in song, for folk music is the music of the people. Folk music gives us, in the most direct way possible, an insight into the lives of ordinary people and how those lives interact with the events of the world in which they're placed. It's wonderful to sing these songs, and feel, for a moment, that you understand the emotions of the songwriter, across the centuries which separate us. For "On the Radio", we took a leap. We've performed show tunes and Broadway songs before. But we'd never gone unashamedly pop. And we had a blast! Charles put together a program of choral arrangements of 20th and 21st century pop songs, ranging from "Mack The Knife", which most people are familiar with from Bobby Darin's 1959 interpretation (although it has a much longer history) to Lady Antebellum's lovely 2010 song "Need You Now". We showcased the vocal talents of Chorale members in a wide variety of solo outings, ranging from Simon and Garfunkel's "Bridge Over Troubled Water" and James Taylor's "Fire and Rain" to Billy Joel's "And So It Goes", "Piano Man", "The Longest Time" and "Loves Me Like a Rock". And we rocked the house with Jerry Lee Lewis' 1957 hit "Great Balls of Fire". For a finale, we chose a medley of Queen songs, arranged by Mark Brymer. The final song in the set was "Bohemian Rhapsody", and it brought the house down! We don't get to finish a concert that way very often! But there's more! We had a band! And a DJ! And an illuminated sign! Our wonderful accompanist, Adam Bravo, got together with Ben Shepard (bass) and Logan Shrewsbury (percussion) to give us a perfect backing. We pulled in Brian Baldini, an accomplished LA-based actor/writer and friend of the Chorale, to host the show. And, for the final, perfect, touch, our old friend Brian Pattinson brought a working "On Air" sign from Seattle, and we built a DJ booth on stage from which Brian Baldini introduced the songs in his unique style. The Chorale's traditional holiday concert featured a range of Christmas and Hannukah songs. Some were new to us, and probably to our audiences, but many were familiar - at least in theory. 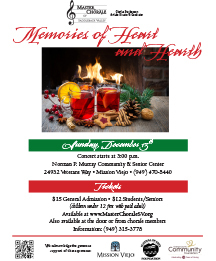 Take, for example, our presentation of a piece broadly based on the familiar "Deck the Hall" carol, but set to the tune of Mozart's "Eine Kleine Nachtmusik". Smiles all around! And who could fail to be delighted by the presence in the program of "I Want A Hippopotamus For Christmas"? Certainly not us! This was a glorious way to celebrate our 50th anniversary. Most choral singers will place the Mozart Requiem close to top of their personal all-time favorite pieces, and it was a privilege to be able to perform this sublime work on a glorious June day.